Apple just announced then new iOS 12 at its annual WWDC event. The new update will be available this fall and it will be available to all devices which currently have iOS11. This means the iPhone 5s and later will be getting the update. Same goes for any iPad released since 2013. Apple has focused big time on performance and that's the first major improvement. The iOS 12 is now much faster than its predecessor with 40% faster app launch, 70% faster camera, 50% faster keyboard, and huge optimizations under heavy load thanks to clever CPU boosts. 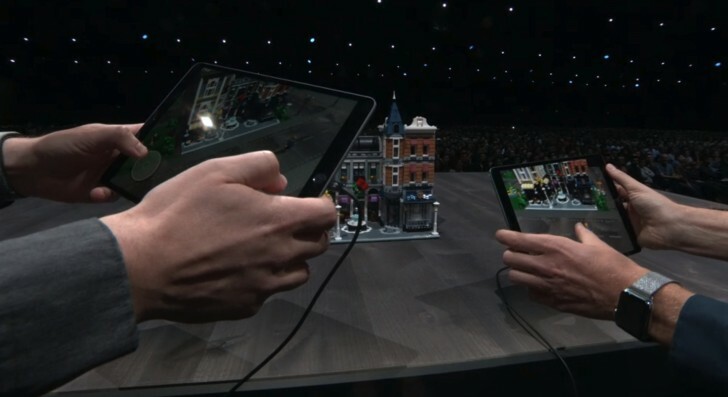 Next, iOS 12 introduces new AR Kit 2 and a brand-new file format for 3D graphics - USDZ. It's an open source format and all native iOS apps will support reading USDZ files. Adobe will also add native USDZ support for Creative Cloud suite. The new AR Kit focuses on shared experiences, where multiple people could be sharing the same virtual environment. Creating content, playing games, or just sharing your creations - it should be very easy to share those experiences with friends. LEGO, among other companies, are on board to create apps that share the same AR environments. 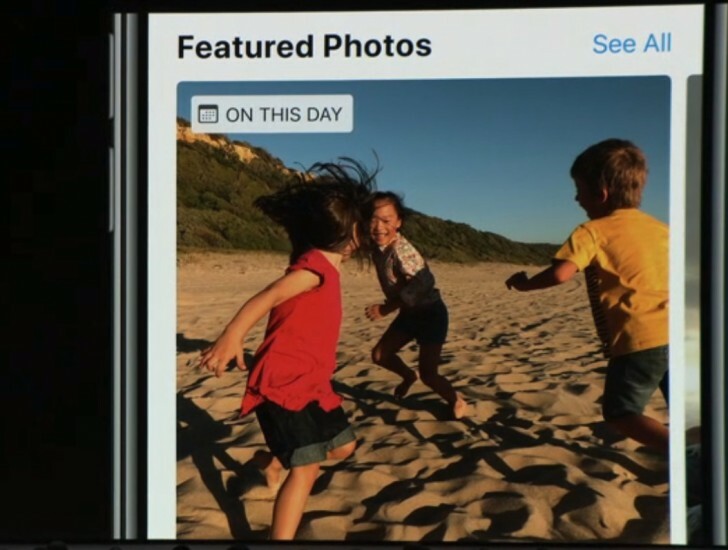 Photos is now getting improved Search with Search Suggestions. You can search by activities, events, locations, vacations, items. Apparently, you can now search by almost anything - even broad terms like museum, office, bar. The Photos app gets an extra For You tab. 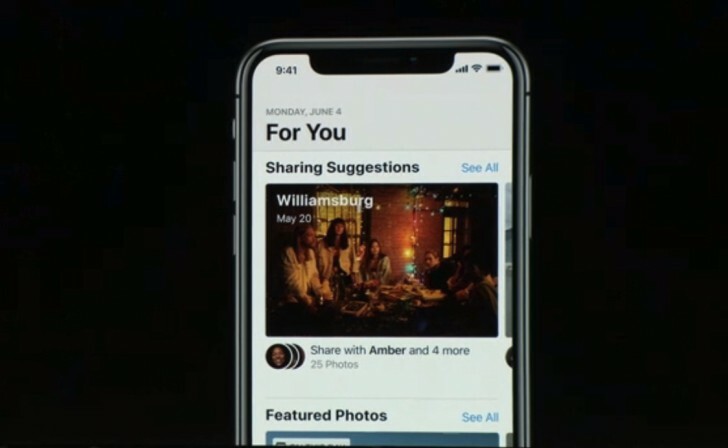 There you'll find automatically generated albums, suggestions for effects, even sharing suggestions - such as sharing your dinner photos with people you've been together with and then it will suggest sharing their photos on their phones with you and the rest. Siri is getting a new feature, too. It's shortcuts. 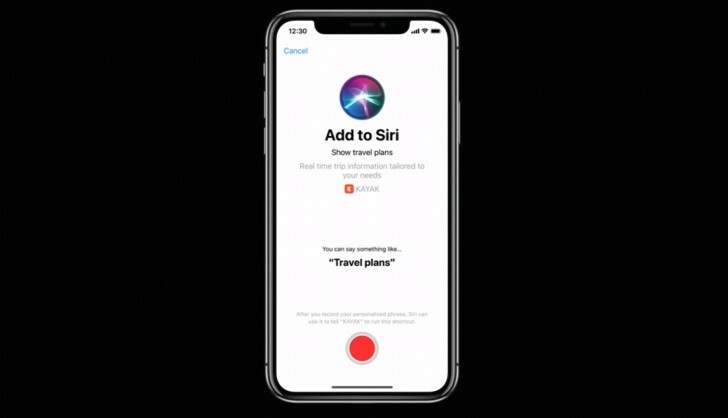 You can create shortcuts for actions Siri could do - like finding your keys, ordering coffee, reserving tables, reminders. There is a new Shortcuts app to help you create all shortcuts involving various apps. Siri Suggestions then uses those shortcuts to, well, suggest you something you might have forgotten. Like ordering your morning coffee, in case you didn't do that on Monday morning. Or suggest sending a message that you'll be late for your meeting with someone. Things like that. The News app is updated with new Browse section, where you can browse by different topics. 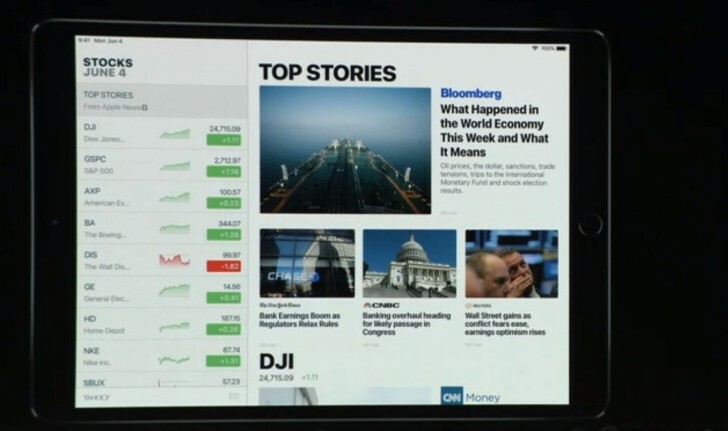 Stocks app now gets News inside it, and it will be available on iPad. Voice memos is coming on iPad, too. There will be iCloud support, as well. The iBooks gets a new design, support for audio books and from now on - it will be called Apple Books. The book store is now part of the Apple Books. Car Play gets support for third-party navigation apps, so if you don't like Apple Maps - you can now change it. Do Not Disturb mode now gets DND bedtime - no more pile of unimportant notifications on your lockscreen during the night. DND is also easy to activate in various forms from the Control Center. Notifications - you can turn on or off notifications from app straight from the lockscreen. Also, iOS 12 now groups notifications by app and topics. 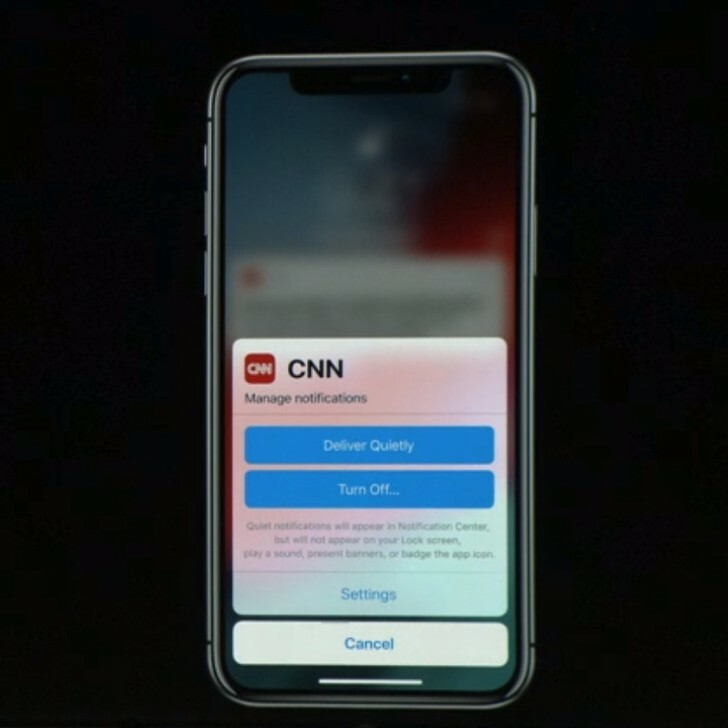 The new iOS will also get you complete weekly reports of how you use your device, what sends you notifications, what time you spent on different apps, among other thorough statistics. You can limit your app usage, say Facebook, by setting a time limit and iOS will stop you after the time is up. The app control goes even deeper with Allowances and downtime. You can limit the usage of your kids iDevices - set time limits on app, downtime on specific hours (bedtime), or always allow some apps. The Messages app is improved with four new Animojis (coala, ghost, t-rex, and tiger) and brand-new tongue detection. Yes, now you the iPhone X will detect your tongue movements, yay! Memojis is the next update for the Animojis - that's an Animoji designed after you. It's like an RPG character creation - you have a ton of options for everything - hair, face, freckles, eyes, sunglasses, ears, you name it. Group FaceTime is the next big thing in iOS 12. You can now facetime with up to 32 people. The feature also integrates with messages and you can dial a whole group chat from within your Messages app. You can join any already ongoing group facetime chat anytime. Replacing yourself with an Animoji/Memoji is now a thing, too.